With the panorama offering fascinating vistas of nature’s beauty at its best, Corbett National Park is a magnificent wildlife reserve nestled in the foothills of Garhwal Himalayas in the districts of Nainital and Pauri, Uttarakhand. The park is spread in an area of around 521 square kilometers. It is the first protected region in the country to come under the Project Tiger. Having a decent assortment of rare and exotic flora and fauna species, Corbett National Park is a perfect hideout for the travelers who want to unravel the engrossing wilderness as it is spread all through the park. Why to choose Corbett for wildlife tour? The diversity of flora and fauna is obviously the major reason to visit the Corbett National Park. Along with enjoying the wildlife tour, one can also take part is several adventure and recreational activities in and around Corbett. The natural vistas all through the park spellbind the tourists and make it a perfect destination for a nature lover as well. 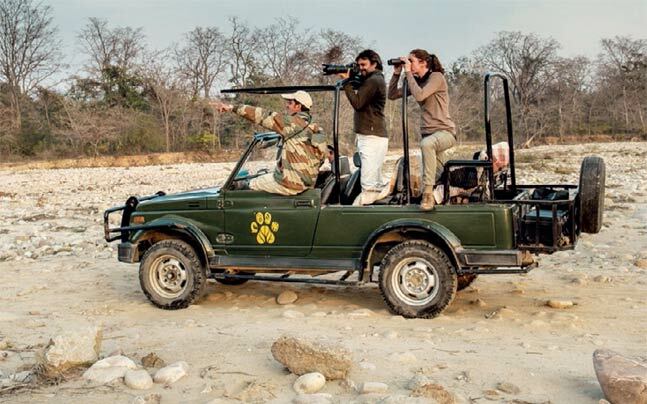 To explore the park, there are three types of safaris available in the park i.e. Jeep Safari, Elephant safari and Canter Safari. Being an idyllic destination to come across wild animals in lap of nature, Corbett serves as a perfect destination for enjoying a wildlife tour. What is the biggest attraction of the park? Intriguing vistas displaying nature’s pulchritude at its best, exotic flora and fauna species, heaps of adventure opportunities et cetera; one can term any of the stated features of Corbett as a major alluring point but to be honest the big regal cats with stripes are the most significant attraction of the park. The remarkable population of tigers draws the attention of wildlife lovers from all over the blue planet. Watching the tigers prowling freely in the woods is, without a doubt, a transcendent site to behold. What are the major fauna species in the park? Other than the tigers, Corbett is affluent with various other rare and exotic fauna species such as Hog Deer, Langur, Asian Elephant, Leopard, Sambar, Crocodiles, Asiatic Jackals, Himalayan Goral, Rhesus Monkey, Himalayan Goral, Yellow Throated Marten and Otters. Because of the noticeable population of fauna species, the park is termed one of the best-preserved wildlife abodes in the country. Other than this, the Ramganga River flowing through the park is rich in plethora of fish species such as Goonch, Mahseer, Indian Trout and Rohu. The major avifauna species found in the park are Bright-Headed Cristicola, Cinereous Vulture, Tawny Fish, Pallas’s Fish Eagle, Great Slaty woodpecker, Wallcreeper, Ibisbill, Rosy Minivet, and White-Tailed Rubythroat. What are the major flora species in the park? The park is bequeathed with natural beauty in the form of exotic flora encompassing alpine flora and fresh water flora. The various regions of the park are occupied Khair Sisso and Sal Forests. As per the reports of Botanical survey of India, Corbett National Park comprises almost 600 species of flora including ferns, trees, grass, shrubs, herbs, climbers and bamboos. Sal, Khair and Sisso trees can be found easily in the park. The major flowering trees in the park are Kachnaar, Madar, Dhak, Jacaranda, Silver Oak and Teak. Other than this, around 10 percent of the park’s total area is made up of grasslands. What is the best time to visit Corbett? Jhirna Zone remains all through the year. Other zones remain close during monsoon season because the roads become washed out in rain. The repair work starts after the rain gets over and in October, the roads become motor-able again. There is a unique experience of visiting Corbett in monsoon. However, the best time for visiting the park is considered as Mid November to Mid June. By Air: Located at the distance of around 127 kilometers, Pantnagar is the nearest airport to the park. To reach the park from the airport, one can simply get the taxi from the airport. Daily flights from New Delhi Airport are available for Pantnagar Airport. This airport is a domestic one. If the traveler is coming from abroad, he or she can reach New Delhi Airport, which is the nearest international airport from the park. By Rail: Ramnagar is the nearest railway station from the park. It is situated at the distance of around 87 kilometers from the park. Traveler can take a taxi from Ramnagar Station to reach Corbett. By Road: Corbett National Park is adequately linked with the significant destinations of North India by a proper road network. Buses run from Delhi to Ramnagar and even Corbett. From Anand Vihar ISBT, there are numerous buses available for Ramnagar. Boasting prodigious and variegated beauty of nature, Corbett National Park is no less than a heaven for all the wildlife lovers in quest of carrying out a memorable wildlife tour. The park is a consummate blend of scenic surroundings and exotic flora & fauna. Through visiting the park, one can relish the never to be forgotten moments of joy, smugness and thrill.